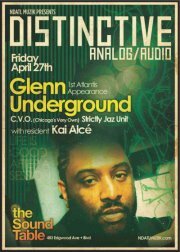 Chicago has been making a big showing in Atlanta recently, with Terry Hunter having played here on Saturday, and Glenn Underground playing Sound Table tonight for his first Atlanta appearance. Kai Alce’s monthly Distinctive has brought some legendary DJs through town, and Alce is a force in his own right, many times opening up for the guest DJ or spinning solo. “Glenn is part of the second generation of pioneers coming from Chicago, right behind legends such as Lil Louis , Larry Heard and Marshall Jefferson,” Alce says. He’s most impressed by Underground’s production — and the Friday-night set is a big deal considering the self-taught keyboardist’s beliefs often prevent such bookings. $10 all night. Doors at 10 p.m., but you may want to come a wee bit later so that Sound Table’s dinner crowd clears out and you have room to dance. ← Chante Sez … I like free stuff. Do you?